Pops Fernandez on finding a boyfriend: "They better look for me, I don't look for them!" Pops Fernandez is not looking, but what if the right guy comes along. She says, "I guess, it'll just come my way. If it's the right one, I'll just figure it out. Naku! Nung bata ako I have all these qualities in my head. But it depends on kung ano yung nag-click, e."
Pops Fernandez, 51, did not mince words about being single. The singer-actress is not even dating. “Wala talaga. Prinangka ko na!" she said, laughing. "Sana rin magkaroon na, pero okey lang,” she added, revealing further it's been a while since she last entertained suitors. “Wala rin! Hindi ako nalabas, iha. I think I’m just happy doing things on my own. “And I’m not saying I don’t want to. It’s just that okey na ako na I take care of my boys. "Although they are already grown up, I take care of my family. Pops was referring to her grown-up sons Robin and Ram with ex-husband Martin Nievera. What is the non-negotiable trait that she looks for in a potential boyfriend? “They better look for me, I don’t look for them!” Pops quipped. Then she said, “I guess, it’ll just come my way. If It’s the right one, I’ll just figure it out. “Naku! Nung bata ako, I have all these qualities in my head. 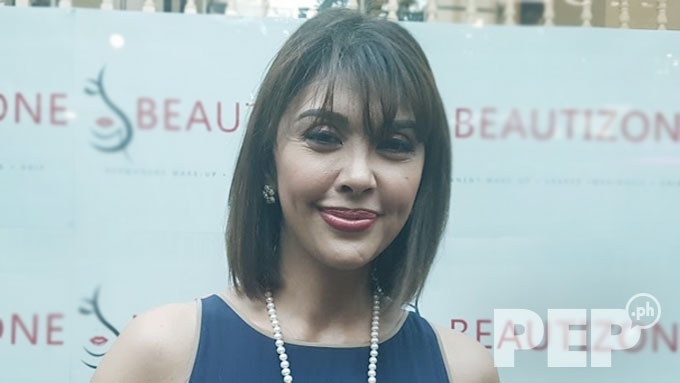 PEP.ph (Philippine Entertainment Portal) interviewed Pops on the sidelines of the media launch for Beautizone, a permanent makeup beauty salon and spa in Upper McKinley, Taguig City, which she co-owns with Vina Morales and businesswoman Macel Pangan. Pops is known as the Concert Queen in the country, but it seems she's been laying low. Pops clarified, “No naman. Maybe because I’m just concentrating on other things. “Kasi ang bata kong nagtrabaho, di ba? So, siguro, now I have more time for my family. "And more time for other things and other businesses. Pops admitted though that she misses singing. “So every so often naman, nakakanta pa rin ako. Hindi lang yung concert na concert. “Ang tagal ko na kasing hindi ginagawa yun. So, medyo may konting nerbiyos, may konting stress. Pops maintained that she’s more comfortable staying behind the scenes than reviving her showbiz career. For the past years, she has produced concerts and shows for fellow celebrities. “I think I like to be on the other side of things. It helps me feel like I’m still part of the business. "And at the same time, nakakatulong pa rin ako sa mga taga-showbiz, di ba? “'Tapos I also get to think of concepts, kung ano yung ideas, nagagawa ko. "So from being creative, it becomes real. When teased about her money-making ventures making her richer, Pops merely laughed.